^ Jarring, Gunnar (1997). “The Toponym Takla-makan”. 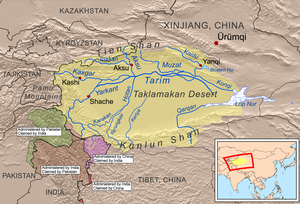 Turkic Languages 1: 227–40. ^ Hobbs, Joseph J. (14 December 2007). World Regional Geography (6th ed.). Wadsworth Publishing Co Inc. p. 368. ISBN 978-0495389507. https://books.google.com/books?id=yAgGHnENHjoC&pg=PA368#v=onepage&q&f=false. ^ Baumer, Christoph (2008-06-30). 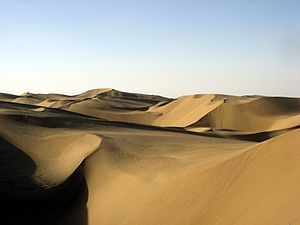 Traces in the Desert: Journeys of Discovery Across Central Asia. B. Tauris & Company. p. 141. ISBN 9780857718327. https://books.google.com/books?id=P1MBAwAAQBAJ&pg=PA141#v=onepage&q&f=false. ^ Hopkirk, Peter (1 November 2001). 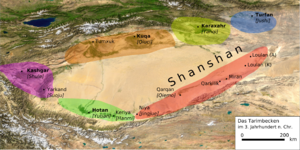 Foreign Devils on the Silk Road: The Search for the Lost Treasures of Central Asia. Oxford University Press. p. 12. ISBN 978-0192802118. https://books.google.com/books?id=EXikxcbKW2YC&pg=PA12#v=onepage&q&f=false. ^ Tamm, Eric Enno (2010). The Horse That Leaps Through Clouds. Vancouver/Toronto/Berkeley: Douglas & McIntyre. 9781553652694 (cloth); 978-1-55365-638-8 (ebook). p. 139.